Beguiling.... Has all that much changed? we can hear the author sighing between the breathless pauses of her fable-like saga." Named by Bustle as One of 9 Fall Book Debuts by Women You're Going to Want to Read Immediately: "You're going to love it. Batalha takes you through nearly 100 years of life in Rio de Janeiro.... filled with intrigue, mystery, sadness, and a whole lot of strong female leads, The Invisible Life of Euridice Gusmao isn't a novel to miss this season." "Humorous and exuberant, this book is a rare treat "
"The arc of this novel, the writing, the characters, are a joy to read." "A worthy debut, full of wry humor"
"With sharp humor and pointed prose, Marta Batalha's novel rebels against the patriarchal forces of her home country." Euridice is young, beautiful and ambitious, but when her rebellious sister Guida elopes, she sets her own aspirations aside and vows to settle down as a model wife and daughter. And yet as her husband's professional success grows, so does Euridice's feeling of restlessness. She embarks on a series of secret projects from creating recipe books to becoming the most sought-after seamstress in town -- but each is doomed to failure. Her tradition-loving husband is not interested in an independent wife. And then one day Guida appears at the door with her young son and a terrible story of hardship and abandonment. 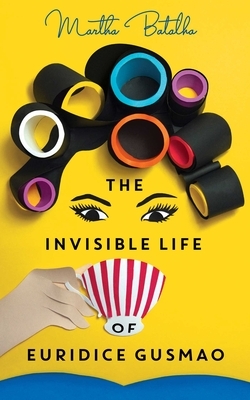 The Invisible Life of Euridice Gusmao is a wildly inventive, wickedly funny and keenly observed tale of two sisters who, surrounded by a cast of unforgettable characters, assert their independence and courageously carve a path of their own in 1940s Rio de Janeiro. A deeply human and truly unforgettable novel from one of the most exciting new voices in world literature.